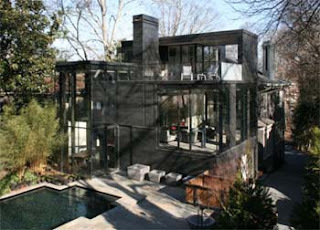 Ansley Park Glass House addition is designed by Brian Bell and David Yocum from the BLDGS Architects. The addition includes kitchen, family room, library, garage and a new stair linking three levels. The new exterior addition includes the glass walls and outdoor space on multiple levels. Ansley Park Glass House has rectangular patterns and horizontal lines. 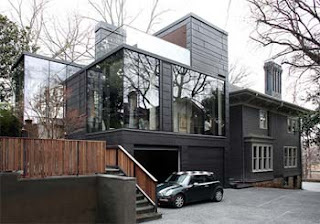 The Solid Black wall and large glass curtain walls opening dominated the exterior of the house. The solid black wall became a contrast to the glass opening creating a balance composition. At night the solid black wall blended with the background and make the glass opening as the main attraction of this great house. The interior use the same contrast template as the exterior and the interior is also arranged into a series of split levels. 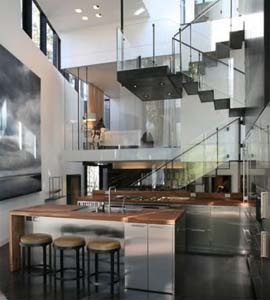 The glass windows, glass stairs and some metal furniture blended with the solid black and white walls to create a balance composition. The stair is suspended from adjacent and overhead structure and the uppermost rooms are cantilevered and suspended over lower ones. 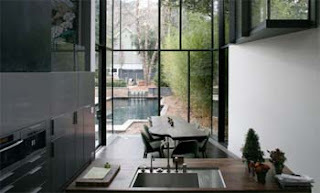 i think i'm in love with this glass homes. the design is just so fabulous. i really liked this homes. planning to construct one soon.thanks for sharing this.